One of the best ways to find your ‘niche’ in our community is to become an active volunteer. Vollunteering offers wonderful opportunities to make new friends with similar interests, and to enjoy the reward of making a difference in the lives of others. Some volunteers quilt and sew, some build trails, and many man information centers at Town Hall and the Community Center, many are guides and docents. The Expo provides lots of opportunities for a wide range of interests. Attend this great event to explore community organizations that provide ways to get involved in activities that warm your heart and use your talents to advantage. 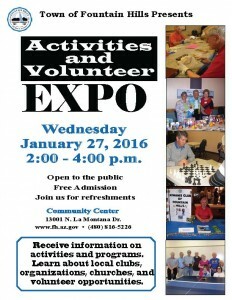 This event is organized by the Town of Fountain Hills and generously sponsored by Fountain View Village. This entry was posted in Area Events, Arts, Culture, Schools & Clubs, Businesses We Love and tagged Town of Fountain Hills Volunteer Expo. Bookmark the permalink.